My newborn daughter has dry peeling skin. Is this normal? Do you recommend using lotion? 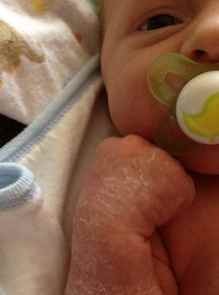 Newborns normally have dry, peeling skin. Babies that are post-dates (more than 40 weeks) often have excess peeling. Newborn skin peeling is usually most apparent at the wrists, ankles and abdomen. This will resolve on its own without lotion or medication. If you would like to apply lotion to help it improve, I would recommend a gentle, unscented lotion. We use Aveeno products on our babies.